We’d love your help. Let us know what’s wrong with this preview of The Knowledge Illusion by Steven Sloman. To ask other readers questions about The Knowledge Illusion, please sign up. The Knowledge Illusion is a demonstration of the thesis it articulates: "Our intelligence resides not in individual brains but in the collective mind...the hive mind." Each of us, as the 18th century philosopher Frederick Leibniz proposed, contributes to what we perceive and conceive as reality. In fact everyone who has ever existed contributes to that reality. We each contribute but none of us can know all that is known. Human knowledge floats in a world beyond human understanding. Plato implies this same idea in the earliest Western philosophy. His eternal Forms are one way to express the inscrutable reality that is shared but not controlled by conscious beings. There is more than a hint of divinity in the potentially infinite power of this shared knowledge. We can only define it in the way that Anselm devised in the 12th Century, as that of which nothing greater can be conceived. This reality is not necessarily true. In fact, it cannot be true because it is continuously changing as new minds emerge and affect other minds through communication. But the idea of an ultimate reality, truth, is essential in order for conscious beings to function in the world without going mad. Truth is that reality which has been constructed, or revealed if one happens to be religiously oriented, by the collective mind at the end of time. The American philosopher Charles Sanders Peirce proposed just this definition of truth in the mid-19th Century. In the 20th Century, Ludwig Wittgenstein recognised that language itself is the carrier of reality. We are born into it and cannot escape its independent power. Language manipulates us every time we use it. Through language, we progress (or not) but as Wittgenstein's contemporary, Martin Heidegger, quipped "Language speaks man" as much as man speaks language. يبحث الكتاب في محدودية معرفتنا كبشر. وتزايد هذه المحدودية مع تضخّم وتوسّع العلوم والمعارف. لا يعيب الكتاب علينا هذه المحدودية، ولا يدعونا إلى سذاجة الإحاطة بكلّ ما يحيط بنا من معارف وعلوم. ولكنّه ينبّهنا إلى أوهام المعرفة وأوهام الفهم التي نحيا فيها. يطرح الكاتب هذه الأوهام كحالات معرفية لها أسبابها ودوافعها؛ و كذلك فوائدها. ولكنّه يسلّط الضوء على خطورتها وتمكّنها و سبل "تجاوزها" وليس "محوها". و يعرض لما يمكن تسميته "تكيّف الإنسان المعرفي" مع هذا النقص الذي يعانيه كاعتماده على المعرفة الجمعية، يبحث الكتاب في محدودية معرفتنا كبشر. وتزايد هذه المحدودية مع تضخّم وتوسّع العلوم والمعارف. لا يعيب الكتاب علينا هذه المحدودية، ولا يدعونا إلى سذاجة الإحاطة بكلّ ما يحيط بنا من معارف وعلوم. ولكنّه ينبّهنا إلى أوهام المعرفة وأوهام الفهم التي نحيا فيها. و يعرض لما يمكن تسميته "تكيّف الإنسان المعرفي" مع هذا النقص الذي يعانيه كاعتماده على المعرفة الجمعية، وعلى المحيط خارجه، وعلى التكنولوجيا في تجسير تلك الهوة المعرفية. على الرغم من فائدة هذه الآليات التكيّفية في تجاوز النقص إلّا أنّها بحدّ ذاتها تجعل الإنسان أكثر توّرطًا في غفلته عن "الجهل" الذي يجهله. لم يعرض الكتاب لما يحيط بتلك الآليات التكيفية من مشاكل معرفية تؤدي إلى اختلالٍ في الفهم واعتلالٍ في الإدراك وما ينبني عليه لاحقًا. Excelente livro sobre como pensamos com a ajuda de outras pessoas, em todos os aspectos. Do consenso entre cientistas, aos companheiros de trabalho, a professores e ao grupo que pertencemos. Como sabemos ou não das coisas e das ilusões e percalços de como pensamos. Um tanto que pode ser encontrado no The Internet of Us: Knowing More and Understanding Less in the Age of Big Data, no A Field Guide to Lies: Critical Thinking in the Information Age e no True Enough: Learning to Live in a Post-Fact S Excelente livro sobre como pensamos com a ajuda de outras pessoas, em todos os aspectos. Do consenso entre cientistas, aos companheiros de trabalho, a professores e ao grupo que pertencemos. Como sabemos ou não das coisas e das ilusões e percalços de como pensamos. Um tanto que pode ser encontrado no The Internet of Us: Knowing More and Understanding Less in the Age of Big Data, no A Field Guide to Lies: Critical Thinking in the Information Age e no True Enough: Learning to Live in a Post-Fact Society. Mesmo assim, consegue acrescentar e juntar bem as ideias. It all begins with toilets. Everyone (throughout the developed world!) is familiar with toilets. A typical flush toílet has a ceramic bowl filled with water. When the handle is depressed, or the button pushed, the water—and everything that’s been deposited in it—gets sucked into a pipe and from there into the sewage system. But how does this actually happen? In a study, graduate students were asked to rate their understanding of everyday devices, including toilets, zippers, and cylinder locks. The It all begins with toilets. In a study, graduate students were asked to rate their understanding of everyday devices, including toilets, zippers, and cylinder locks. They were then asked to write detailed, step-by-step explanations of how the devices work, and to rate their understanding again. Apparently, the effort revealed to the students their own ignorance, because their self-assessments dropped. Sloman and Fernbach see this effect, which they call the “illusion of explanatory depth,” just about everywhere. People believe that they know way more than they actually do. So not just rationality but the very idea of individual thinking is a myth. Humans rarely think for themselves. Rather, we think in groups. We think we know a lot, even though individually we know very little, because we treat knowledge in the minds of others as if it were our own. This is not necessarily bad. Our reliance on groupthink have us an edge over all other animals and turned us into the masters of (this) planet. The knowledge illusion enables us to go through life without being caught in an impossible effort to understand everything ourselves. From an evolutionary perspective, trusting in the knowledge of others has worked extremely well for humans. This borderlessness, or, if you prefer, confusion, is also crucial to what we consider progress. As people invented new tools for new ways of living, they simultaneously created new realms of ignorance; if everyone had insisted on, say, mastering the principles of metal-working before picking up a knife, the Bronze Age wouldn’t have amounted to much. When it comes to new technologies, incomplete understanding is empowering. Encouraging people to be more realistic about their ignorance is, as it sounds, very hard! People rarely appreciate their ignorance, because they lock themselves inside an echo chamber of like-minded friends, and self-confirming news-feeds, where their beliefs are constantly reinforced and seldom challenged. It’s not really hard then to understand what (dafaq!) is happening around, especially in the current political scene in US and India. "...direct democracy is vulnerable to manipulation just like other forms of governance. "We have seen that a good way to reduce people's extremism and increase their intellectual humility is to ask them for an explanation of how a policy works. Unfortunately, the procedure does have a cost. Exposing people's illusions can upset them. We have found that asking someone to explain a policy that the person doesn't really understand does not improve our relationship with that person. Frequently, they no longer want to discuss the issue (and indeed, often they no longer want to talk to us). "We had hoped that shattering the illusion of understanding would make people more curious and more open to new information about the topic at hand. This is not what we have found. If anything, people are less inclined to seek new information after finding out that they were wrong. Causal explanation is an effective way to shatter the illusion, but people don't like having their illusion shattered. In the words of Voltaire: 'Illusion is the first of all pleasures.' Shattering an illusion can cause people to disengage. People like to feel successful, not incompetent. "A good leader must be able to help people realize their ignorance without making them feel stupid. This is not easy. One way is to demonstrate that everybody is ignorant, not just the person you're talking to. Ignorance has to do with how much you know, whereas being dumb is relative to other people. If everybody is ignorant, then no one is dumb. "Nudges are libertarian in the sense that they don't reduce people's ability to choose. Nobody is preventing you from eating a large pizza or from being an organ donor or not. But they are paternalistic in the sense that somebody else decides which options are going to be encouraged. Somebody else has put the pizza later in the cafeteria line so that you're more likely to choose the salad. The main argument for this kind of paternalism is that the choice has to be made one way or another. Something has to be earlier in the cafeteria line, so why not make it the item that people feel most attracted to when they are not in the heart of the moment, when they can think dispassionately about what the best food options are? The Knowledge Illusion has a reasonably simple idea to start with. The authors repeat that numerous times. They meander in multiple directions but almost always come back with nothing but vague directives or known generalities. Despite the authors' own admission towards the end about the topics and discussions sounding commonplace (and trying to make a virtue out of the ordinary), a lack of anything substantially new leaves one highly disappointed. An individual knows precious little on her own. The Knowledge Illusion has a reasonably simple idea to start with. The authors repeat that numerous times. They meander in multiple directions but almost always come back with nothing but vague directives or known generalities. Despite the authors' own admission towards the end about the topics and discussions sounding commonplace (and trying to make a virtue out of the ordinary), a lack of anything substantially new leaves one highly disappointed. - Only teams or a collection of individuals have achieved almost everything worthwhile throughout the history of mankind. Almost all achievements that are ascribed to lone individuals like Martin Luther King or Einstein were largely because of the teams and circumstances surrounding them and would have been achieved even without those precise figures. A highly dubious claim which in the least required much more justification than simply an assertion. - Separately the authors go on to warn that teams or a collection of individuals are prone to group thinking which is dangerous and should be avoided. An aside: such suggestions and directives on what all individuals should be following spring up without any preludes or forewarnings throughout. - Best individuals do not make the best teams. Like in other cases, only generalities are provided if you want advises on what would result in a good team. - Machines cannot have or share the intentionality that humans have. An extremely naive view that goes something like this: only a human can have an intentionality or a desire like going from place A to place B via a sunset route. According to the book, machines are mere tools that would efficiently facilitate our intentionalities and can never replace humans because of the lack of intentionality. The book - in a span of a page or two - seems to cast aside the concepts like Singularity without ever recognising the simplest of possible objections like machines' (AI etc's) ability to unearth desires that we could be unaware of or create things that lead to completely new desires (social networking for instance) or even separate intentionality from objectives that machines can easily have without any interventions in the world we are headed to. - A good section on how we become more aware of our lack of knowledge once primed through a series of questions that make us deliberate about the boundaries of our knowledge. - The book also feels that we are likely to accept what we don't know when it comes to opinions more when we are provided with causal or consequential reasonings (only in a sufficient and not excessive quantity) and not explanatory rationales. - We should rely on experts while keeping in mind that they too have their own biases. Still, many decisions cannot be left to crowds and should primarily rely on experts' opinions. To a degree, this is against the grain of the book's theme, but the contradiction is never felt by the authors to provide any explanations. - Even a small saving every month could add up to a huge amount in a few decades' time!! I loved it. While still about general cognitive biases and illusions, it goes well beyond many of the typical books about it. Its main premise is that knowledge, at least the vast majority of it, isn't in our heads per se, but rather our intelligence lies in the people and things around us. Despite this, though, we feel that it's part of our own knowledge. Sloman and Fernbach see this effect, which they call the “illusion of explanatory depth”: People believe that they know way more than they ac I loved it. While still about general cognitive biases and illusions, it goes well beyond many of the typical books about it. Its main premise is that knowledge, at least the vast majority of it, isn't in our heads per se, but rather our intelligence lies in the people and things around us. Despite this, though, we feel that it's part of our own knowledge. Sloman and Fernbach see this effect, which they call the “illusion of explanatory depth”: People believe that they know way more than they actually do. Best exemplified by how little we understand everyday devices, like toilets, zippers, and cylinder locks. A book about ignorance, focusing on a lack of personal mindfulness in making everyday decisions and the appraisal of hive-mentality (trusting communal knowledge). The main concept of the book is based on all of us thinking we know more than we do and an importance of trusting expertise of a wider community instead of trying to solve every problem individually. In my opinion, the book is a bit too descriptive; it presents a case study after a case study of the same ideas without a deeper analysis A book about ignorance, focusing on a lack of personal mindfulness in making everyday decisions and the appraisal of hive-mentality (trusting communal knowledge). The main concept of the book is based on all of us thinking we know more than we do and an importance of trusting expertise of a wider community instead of trying to solve every problem individually. In my opinion, the book is a bit too descriptive; it presents a case study after a case study of the same ideas without a deeper analysis or conclusion; authors don't offer much of an advice on how to be more focused and mindful, nor do they explore different cultures beyond the western world (I would argue, that the hive-mentality is something worth investigating in a context of Asia and other places); and there is almost no mention of individual responsibility and a negative side of hive-mentality (beyond one paragraph in the end of the book, which felt more like ticking off the box rather than making a serious point). We think we know much more than we do. In fact, most of us do not know much about even how every day things work. The authors gave 2 simple examples: the zip and the toilet bowl. First they asked how much people understood them. Then they asked them to actually explain it, and most of them have great difficulties doing so. When finally asked again how much they understood them, the professed lower understanding. So how can we do this? We can do this because our knowledge lies in the totality of We think we know much more than we do. In fact, most of us do not know much about even how every day things work. The authors gave 2 simple examples: the zip and the toilet bowl. First they asked how much people understood them. Then they asked them to actually explain it, and most of them have great difficulties doing so. When finally asked again how much they understood them, the professed lower understanding. So how can we do this? We can do this because our knowledge lies in the totality of human society. We do not need to know how things work as long as they do. We don't need to understand how integrated circuits work to use our iphones. Any of us know only a little bit, but together we are wise. So we need to know more about what we do not know. Talking to people, listening to viewpoints different from our own helps. However, big strides are always made by people with big dreams, a.k.a. people with the. invest knowledge illusion. That's what propels us to the moon, explore new worlds, and make new discoveries. Best part of illusions is how few of us ever recognize that we live in them. We all have an over-inflated confidence in our understanding. Our grasp of reality is extremely superficial, but this isn't entirely a bad thing, despite how much social commentators lament the ignorance of the average person the reality is that the human mind was never designed to act in isolation. Instead the true genius of the human brain is how it is optimally designed to work in concert with other minds which in tu Best part of illusions is how few of us ever recognize that we live in them. We all have an over-inflated confidence in our understanding. Our grasp of reality is extremely superficial, but this isn't entirely a bad thing, despite how much social commentators lament the ignorance of the average person the reality is that the human mind was never designed to act in isolation. Instead the true genius of the human brain is how it is optimally designed to work in concert with other minds which in turn creates a larger social intelligence. Unlike computers that can only process data, the human brain is an intentionality machine that devotes much of its processing power to figuring out the intentions of others. This is important because it is what allows humans to form complex social groups. It's like each brain is designed to be "plugged" into other human brains. That is where humans become truly remarkable and excel, in groups and teams. Homo-sapiens have gone from stone tools to the moon and it has all been because of collaboration. No single human being could have achieved it, but together we can. "Most people just want the best health care for the most people at the most affordable price. The national conversation should be about how to achieve that. But such a conversation would be technical and boring. So politicians and interest groups make it about sacred values. One side asks whether the government should be making decisions about our health care, prompting their audience to think about the importance of limited government. The other side asks whether everybody in the county deserves decent health care, prompting an examination of the value of generosity and preventing harm to others. Both sides are missing the point. We all have roughly similar basic values. We want to be healthy, we want others to be healthy, and we want doctors and other medical professionals to be compensated, but we don't want to pay too much. A book I did not read at once. Instead I read a little...put it down...went back to it from time to time. Enlightening and somewhat enjoyable. I did not love the book but I did not hate it. I enjoy that I have it on my self because it is a book I can go back and reference, or take a few lines from, etc. Again..enlightening...entertaining...a bit of food for thought.. 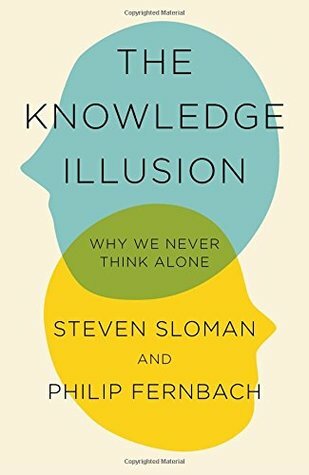 The Knowledge Illusion: Why We Never Think Alone by Steven Sloman is an interesting book and one that can def spark an intelligent A book I did not read at once. Instead I read a little...put it down...went back to it from time to time. Enlightening and somewhat enjoyable. I did not love the book but I did not hate it. I enjoy that I have it on my self because it is a book I can go back and reference, or take a few lines from, etc. Again..enlightening...entertaining...a bit of food for thought.. The Knowledge Illusion: Why We Never Think Alone by Steven Sloman is an interesting book and one that can def spark an intelligent debate. Sloman and Fernbach are professors with a background in cognitive science. In this book, they explain why we know less than we think we know; we fill in the gaps by leveraging the knowledge of others. This seems obvious, and it is — I didn't find much in the book surprising. (In its conclusion, the authors admit that the ideas they discuss have been around for a long time.) However, Sloman and Fernbach use simple, real-world examples that make it easy to relate to the issues. I would recommend t Sloman and Fernbach are professors with a background in cognitive science. In this book, they explain why we know less than we think we know; we fill in the gaps by leveraging the knowledge of others. The information in here is important, but it's kind of a dry read, and it didn't start getting good until over halfway. It's the literary equivalent of a wheat grass shot. 5 stars for content, but 2 for my actual enjoyment of it. So, I'm taking a class that gave us a number of books to choose from to write an essay on how it connects to the subject matter we're discussing (i.e. Information Communities). I decided to go with The Knowledge Illusion: Why We Never Think Alone. I won't post my boring essay, but I'll just give a basic description of the book and a short rundown of my thoughts. In the Knowledge Illusion the authors are making the point that since human brains evolved to filter out most information, much of what So, I'm taking a class that gave us a number of books to choose from to write an essay on how it connects to the subject matter we're discussing (i.e. Information Communities). I decided to go with The Knowledge Illusion: Why We Never Think Alone. I won't post my boring essay, but I'll just give a basic description of the book and a short rundown of my thoughts. In the Knowledge Illusion the authors are making the point that since human brains evolved to filter out most information, much of what we think we "know" is actually external information gathered from our knowledge community (friends, family, local experts (e.g. plumbers), teachers, books, and the internet. “We fail to draw an accurate line between what is inside and outside our heads. And we fail because there is no sharp line. So we frequently don’t know what we don’t know” (15). They give many examples throughout and one such example was that of the zipper. Participants were asked to rate on a scale how well they understood how zippers work. Next, they were asked to explain how zippers work in as much detail as possible. Last, they were asked to once again rate how well they understood zippers. Not surprisingly, participants rated their knowledge lower the second time around. The authors refer to this throughout as an Illusion of Understanding. They explain that humans in general are guilty of this because it's simply how our brains evolved. We seamlessly pull information from our external environment (knowledge community) and blend it with our internal environment (our mind). In the concluding chapter of "The knowledge illusion", the authors argue that really novel ideas often seem obvious once they are accepted. Without false modesty, they try to convince the reader that the central idea of their book indeed falls into this category. As far as I am concerned, they may well be right. And the reader is thus warned that he may find everything that follows trivial. The key message is that people are not just incredible ignorant (even when they are very smart), but that th In the concluding chapter of "The knowledge illusion", the authors argue that really novel ideas often seem obvious once they are accepted. Without false modesty, they try to convince the reader that the central idea of their book indeed falls into this category. The key message is that people are not just incredible ignorant (even when they are very smart), but that they are orders of magnitude more ignorant that they realize. The key reasons for this discrepancy are: (a) there is infinitely more to know than even the smartest people in the world can remember (and even less understand) (b) people usually don't feel the practical consequences of this ignorance because they can rely on the cumulative knowledge of all other people. If you're not convinced, just try to explain how a zipper or a toilet works. So you think this is trivial? Well, once you read it, it is rather obvious, but the implications of this idea are far reaching. •	Given that knowledge is distributed over specialists, what is most important in teams? The brilliance of their individual members or the capacity of the teams to work together and to get the most out of the (hopefully complementary) competences of the individual members? •	If it is impossible to have anything more than a very superficial understanding of most issues, should schools emphasize learning as many facts as possible or (you guess it) cooperating and sharing with others? •	If people's thinking is embedded in a community of people, how can you convince them of mistaken views if these views are shared by their peer group? (Hint: not by confronting them with objective information or rational arguments). So no, this is not just another clone of "Thinking fast and slow" or "Predictably Irrational" (even if there is some overlap). Through its emphasis on the social aspects of knowledge, this book really does stand out from the crowd. Its style is engaging without being shallow, and most of the argumentation is well grounded in academic research. This book is required reading for educators, students (especially for the smartest amongst them) and for anyone who needs to be reminded how little he know and how much he depends on the knowledge of innumerable anonymous others. For all of us, basically. - Bildiğimizi sandığımız şeyleri aslında bilmiyoruz. Çünkü beynimiz verimli çalışabilmek için bilginin kendisini depolamaktan ziyade, o bilginin nereden hızlıca bulunabileceğinin bilgisini depoluyor. Bu nedenle beynimiz çevremizdeki tüm nesnelere, insanlara bilgi kaynağı gibi yaklaşıyor. - En üretken düşünme biçimi bir grup insanla birlikte düşünmek. 5 insanın birlikte düşünmesi, 5 kişinin ayrı ayrı düşünebileceğinin toplamından daha fazla. An Audible listen, this book was very interesting. Starting with studies on how little detailed understanding we have of things like toilets, zippers and other every day objects. it then moved to the fascinating observation that, despite this, we rate ourselves "experts" on most things. When asked to explain, few can, and when asked to explain in a "cause and effect" manner, we usually realise our deficiency. There were many studies and anecdotes punctuating such observations. Most of them jaw dr An Audible listen, this book was very interesting. Starting with studies on how little detailed understanding we have of things like toilets, zippers and other every day objects. it then moved to the fascinating observation that, despite this, we rate ourselves "experts" on most things. When asked to explain, few can, and when asked to explain in a "cause and effect" manner, we usually realise our deficiency. There were many studies and anecdotes punctuating such observations. Most of them jaw dropping - like the "facts" about the world that so few people got correct. I have a lot to say about this book - much of which I cannot now tell you - which in some ways proves its point. As the authors made their case through historical and current examples plus experiments and results, it made complete sense. Yet to articulate the points to you now is impossible for me (not because the authors failed, purely my own choice to read and not study the content). The information is shared in a way that communicates without condescending. Humbled by this book and highly reco I have a lot to say about this book - much of which I cannot now tell you - which in some ways proves its point. As the authors made their case through historical and current examples plus experiments and results, it made complete sense. Yet to articulate the points to you now is impossible for me (not because the authors failed, purely my own choice to read and not study the content). Книга о том, как мыслит человек. В жанре популярная наука. Ключевая идея, что знание и мышление - это явления, относящиеся к больше коллективу и обществу, чем к индивиду. Индивидуально человек знает очень мало и обладает жалкими мыслительными способностями. Много интересных идей, которые иногда кажуться очевидными... but ideas are obvious only when you think about them. Пять из пяти. In a world of growing complexity, we are all more interdependent than we think, and our intelligence isn’t stored within our own brains. Sloman and Fernbach show us the humbling limits of our individual knowledge, as well as the power of the community of knowledge. The book is both relevant and important. meh, i agree with the point. Intelligence is spread across the community. part of the reason we've progressed so much over the past few decades. knowledge isn't a monopoly anymore in the hands of a few elite institutions/church. The book just makes that point over and over. To long. This book is one of my favorites for this year. I LOVED it. This is the argument against Arthur Schopenhauer's philosophy on intelligence. One says to be alone is the great strength, while the other argues for collaborative enterprise, and this one wins. I really don't know where to begin. This book blew my mind and taught me a lot. I was full of curiosity and wonder while reading. I already want to reread it actually. Whoever this author is, Steven Sloman, you are brilliant. Great 115% = 6 Stars? Whoever this author is, Steven Sloman, you are brilliant. Great book! This book argues that human intelligence is communal, rather than personal. I felt like this book had a potentially very strong idea that it diluted through various applications. The opening suggests that the way we fundamentally think about knowledge and thinking is flawed, which is a lot more than I'd expect from a pop science book. But much of the elaboration of that theme was the same few ideas, and I felt the chapters on AI and IQ were pretty shallow attempts to tie in their main theme. Should I post my 1,000-word review for this book which I had to write for one of my Masters's classes? It was a solid read, helped me realize how much I don't know! Overall, I felt the first few chapters were enough to teach me of the concept, would have read better as a paper and maybe not a book.